Luxury has it perks, as does reeling in a travel bargain. Travelers who enjoy mixing it up will find Yountville the ideal wine country locale. From railway digs to nine-course dining gigs, this epicurean enclave serves up a variety of inns, dining and attractions to fit any budget. Setting the bar, Bardessono inn and spa steps up as the world’s third LEED platinum-certified hotel offering a wealth of luxury amenities tied to sustainable practices. A suite at this 62-room eco-chic property sporting underground geothermal system and smart guestrooms sets a good pace ($950/dbl. ), as does a stay at the exclusive five-room Poetry Inn or nearby Cottages of Napa Valley. Offset that with a romantic romp off track at Napa Valley Railway Inn. This quaint mix of 100-year old railcar suites set along the original Napa Valley Railroad track (1870) is a bargain starting at $125/dbl. Slither into the Coffee Caboose for a cup of Lindsay’s French pressed joe for $2. 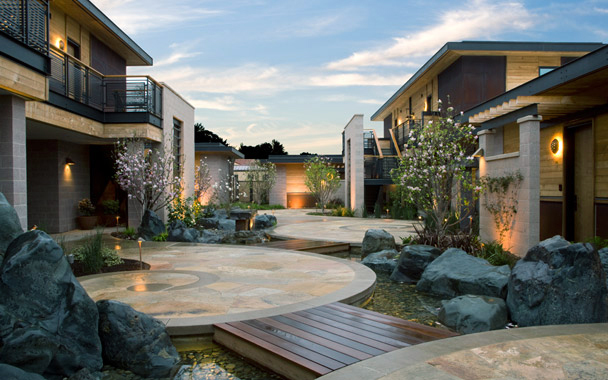 Also on the dime for deals, the newly-opened Hotel Luca’s “Springtime Joys of Napa Valley” package, which includes queen accommodations, a country-style breakfast and 20% discount at the Luca Spa, starting at $259/dbl. Other options for keeping the 401(k) in check include the historic Maison Fleurie (1873) and Lavender properties’ new “Carpe Diem” rates starting at $130/dbl., including breakfast. At the north side of town, the gracious Napa Valley Lodge, with vaulted ceilings, terraces and balconies overlooking the vineyards make wine country easy with rates starting as low as $199/dbl. Boasting six Michelin stars and enough top toques to launch a world tour, this “culinary crushpad” has something for every palate and price range. Belly up for a nine-course gallop at Thomas Keller’s renowned French Laundry ($250/person), then wander across Washington Street for a free trek through the restaurant’s two-acre organic culinary garden. Slide into a chef Sean O’Toole’s six-course market tasting menu at Bardessono ($85/person) or saunter across the street to Hurley’s Restaurant and Bar for smoky Oakwood Grilled Atlantic Mussels ($15) and crisp sauvignon blanc; for lunch, the two-course Vintner’s Menu at $18 can’t be beat. Francophiles can get their fix down the street at Bistro Jeanty. Here, a lusty coq au vin and side of haricot verts delivers the Left Bank for under $25. Nearby, the newly Michelin-minted etoilé at Domaine Chandon offers a seductive three-course Tastemaker Dinner with wine pairing ($95). Those on a tighter leash can opt for Michael Chiarello’s Bottega in V Marketplace. Snag an alfresco seat and dive into his signature polenta underglass or Pecorino cheese pudding followed by wood-grilled spiced quail for under $40. On a higher note, the new Chef’s Table features a four-course repast with wine averaging $100/person. The new Cantinetta Piero is the spot for family-style dining – a concept with a cap. Simple rustic dishes, including homemade pasta and salumi and whole fish and roasted meats, round out the menu. Lunchtime paninis are just $9. Across the street behind Pancha’s Saloon, the new taco truck — Tacos Garcia — is where you’ll find local dignitaries and vintners scouting out lunch. Step up for $2.00 fish tacos (grilled not fried) with cabbage and a spicy dressing and bring your haul into the saloon for lunch and a brew. For brunch, indulge in a Redd lobster club or steak and eggs with creamed spinach ($27) at Richard Reddington’s top spot or opt for a visit to Bouchon Bakery for an ethereal quiche Florentine and selection of doggy treats for under $10. For Keller on a budget, pop into ad hoc for a seductive three-course brunch including steak and eggs with wild mushrooms for just $34. On the liquid site, enjoy morning mimosas, bellinis and pastries via Domaine Chandon’s “Bright Eyed and Bubbly” tasting for as low as $11.50. Better yet, book at stay at Villagio Hotel & Spa or the Vintage Inn and indulge in classic champagne buffet which, along with in-room wine, is complimentary. Sure the high life exists here as does a variety of adventures for the budget minded. If the sky is the limit, start the day aboard Adventures Aloft for a classic hot air balloon tour of the vineyards, followed by breakfast ($295/semi private). Nearby, the fungi never looked so good than at Domaine Chandon’s Mushroom Garden. Gracing the entrance to Yountville’s premiere sparkling wine house, the lush garden sports some 300+ ‘shrooms haphazardly displayed in a natural setting (free). A hop away, the Napa Valley Museum offers an inside track on the region’s wine and culinary roots ($4.50, free Mondays). For history buffs, The Walking Historical Tour & Pathway Map links the dots to nearly 30 stops including five National Register of Historic Places (free guide at visitors center). For those seeking a deeper connection, grave-spotting is a great pastime. At the Pioneer Cemetery curious travelers can visit the ancient Indian burial grounds of the Wappo tribe. The original wood marker still exists, as does an updated tombstone bearing information on the region’s first recorded inhabitants. George C. Yount also rests here along with a collection of colorful characters tied to the town’s past. Nearby, the Veterans Home Cemetery – set amidst 500 acres of native oak – sways hill and dale with a sea of 5,000+ stoic alabaster headstones backed with a view of lush vineyards. If fanning the flames is in order, slither in for a full-body blow out at Spa Villagio. The 3 ½- hour Suite Sensations “Together – A Romantic Ritual of Pleasure” is certain to kick start things using a secret mixture of Arabian infused oils ($1150/couple). Offset the cash drop with a spin through the stately Gallery at Cliff Lede Vineyards. Here, visitors can tap into a stunning collection of contemporary sculptures and art from the collection of proprietor Cliff Lede. In the original fermentation room lies a chic little gallery with crisp walls, concrete floors and clean lines (free). Scouting for upscale art and antiques is the ticket at Ma(i)sonry wine salon and V Marketplace as well. Birders and butterfly enthusiasts can tuck away for a day of hiking at the nearby Napa River Ecological Reserve, a greenbelt sporting 73 acres of outback including 150+ species of birds, butterflies and mammals and some 238 documented plants (free). Outdoor enthusiasts can also tee up at the Vintner’s Golf Club, a tight little nine-hole championship course originally designed by Casey O’Callaghan in 1999. Wednesday is deal day — $10 for nine holes. From the tee box to the saddle, Napa Valley Bike Tours offers a variety of excursions from private tours ($245/person) to self-guided tours including a picnic lunch and wine purchase pick up for just $89/person. Cheaper yet, have a bike delivered to your hotel and hit the road for just $15 ($79 for an electric). Avid oenophiles will find the tight-knit layout of Yountville’s 24+ wineries within its appellation a pleasant diversion. In town, 11 tasting rooms link Washington Street, making the carbon footprint even more desirable. Here visitors can belly up for elaborate food and wine pairings at Girard Winery ($40/person), indulge in a top-line Collectors Flight tasting at Ma(i)sonry ($40/person) or step up for a champagne sabering course ($75, plus wine) or one-on-one blending seminar with a winemaker at V Wine Cellar ($150). 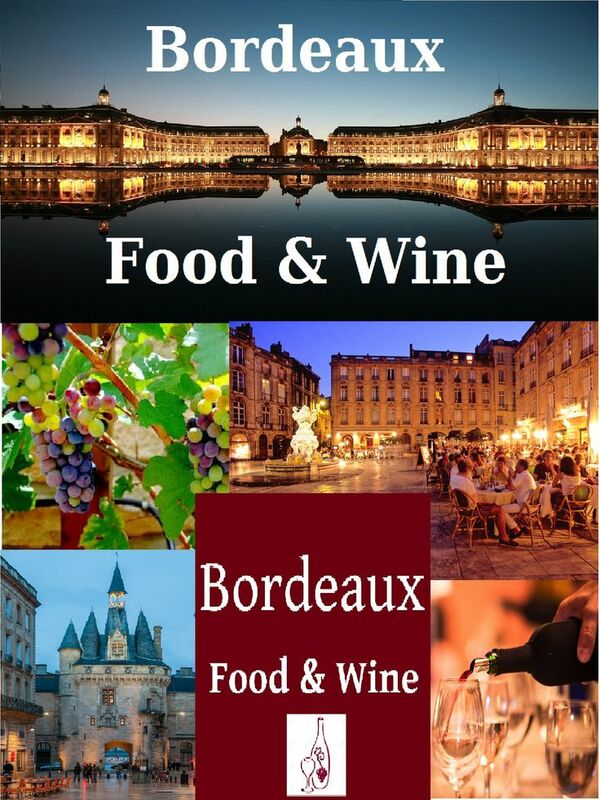 Those seeking a bit more education can tap into the free Wine Basics Class held every Saturday at Goosecross Cellars. This fun and informative course focuses on the sensory evaluation of wine and is a great jumping off point for a day of swirling (free). The Yountville Visitor Center also offers two-for-one tasting coupons at Domaine Chandon and complimentary tasting for two vouchers at Cornerstone Cellars and Jessup Cellars. Connect the dots via the free Yountville Trolley. Yountville turns up the heat with the annual “Moveable Feast” program. From value-season hotel/dining packages to a roux of prix-fixe meals rolling off the lines, foodies on a fast track can tap into town-wide deals (December – February). The Taste of Yountville (March) uncorks a good time in conjunction with the annual Napa Valley Mustard Festival (Feb./March). Site of Napa Valley’s first planted vines (1838), Yountville sits at the epicenter of the region’s culinary scene sporting the Valley’s top-ranked restaurants (six Michelin stars), 24+ wineries and/or producers and 11 lodging properties. An ideal base for the avid oenophile, Yountville offers the county’s only hot air ballooning launch, five National Register of Historic Places sites, a microclimate pedigree with its own AVA, world-class shopping and performing arts. Located 55 mi./88 km. north of San Francisco, travelers can arrive via scenic Highway 29 or via Napa County Airport, Sacramento (SMF), Oakland (OAK) or San Francisco (SFO) international airports. For more information and travel inquiries, contact the Yountville Chamber of Commerce at 707.944.0904 or www.yountville.com. This has definitely sparked up an thought in my thoughts. That is an amazing web site. This weblog is superior. 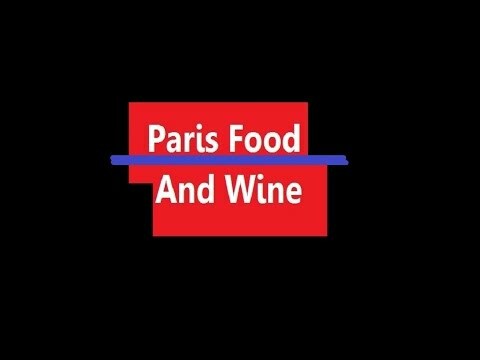 It’s one of the best Food and Wine sites on the internet!